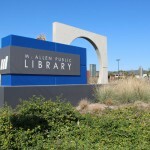 The new McAllen, Texas, Public Library – which opened on the site of a vacant Walmart in December 2011 – was envisioned by city officials from the start of architectural bidding to include environmentally friendly features. 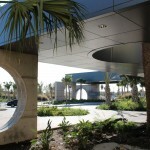 But, from the perspective of Boultinghouse Simpson Gates Architects in McAllen, no design could be more environmentally conscious than adaptively reusing the former “big box” retail store, saving approximately 130,000 square feet of building demolition debris from being sent to the local landfill. 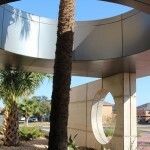 The McAllen City Commission agreed, awarding the project to Boultinghouse Simpson Gates, which served as architect of record. 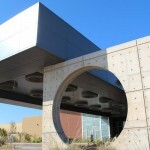 The adaptive reuse design of the McAllen Public Library almost could seem to embody Walmart’s marketing slogan: “Save money. Live better.” But, as directed by the city commission, the look of the new library was in no way to resemble the building’s previous retail tenant, according to John Gates, AIA, principal, Boultinghouse Simpson Gates Architects. 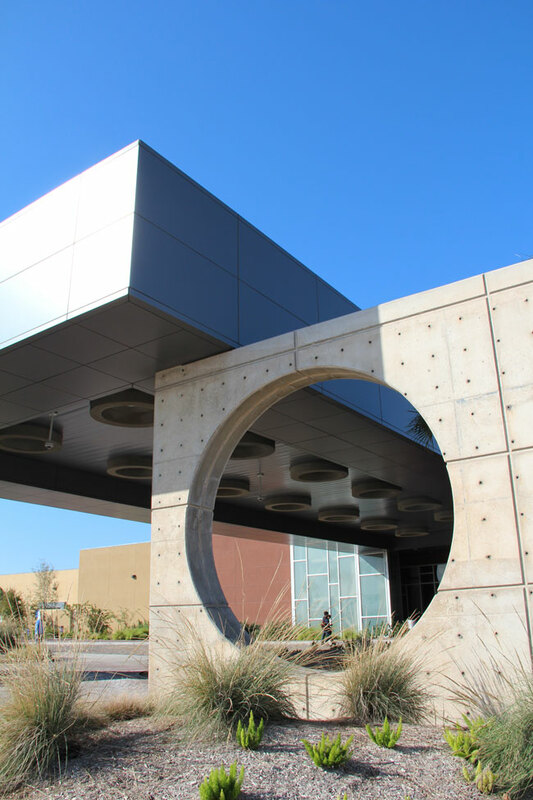 By adaptively reusing the building, the new $25.7 million McAllen Public Library occupies 123,000 square feet on one floor, making it the largest one-story library in the country. But the former “big box” building’s appearance drastically has been altered with dramatic exterior features, including a 108-foot by 44-foot main-entry canopy, which is clad in Alucobond aluminum composite material. 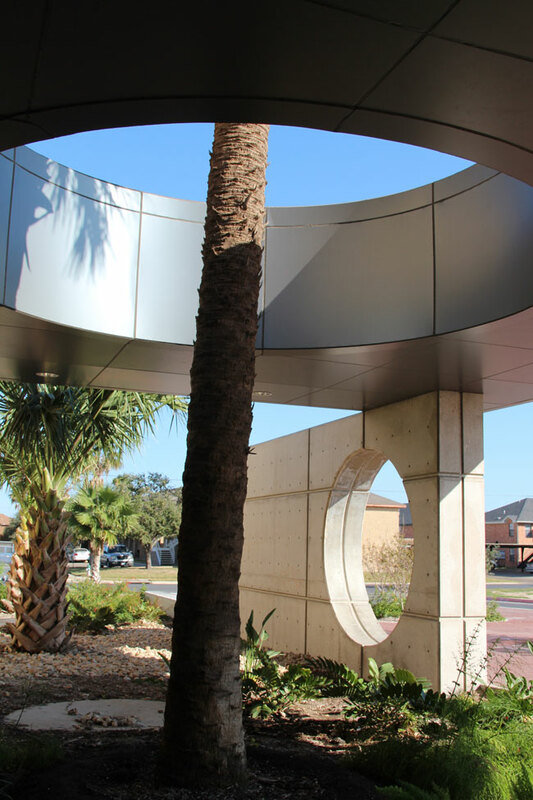 A total of 15,000 square feet of 6mm Alucobond ACM in the contemporary Steel City Silver Mica color was installed on the McAllen Public Library, including as cladding on the main entry canopy and on a secondary entry canopy. Alucobond also was installed on the library’s exterior identity signage and as building trim. The main-entry canopy is supported by two concrete walls – one of which is submerged in a pool and includes a circular opening. Water cascades through the opening into the pool. This water-wall was designed to pump more than 2,000 gallons per minute to mask traffic noise from a nearby busy intersection and to cool the area surrounding the canopy on hot days. Alucobond ACM is installed as library signage that wraps around three sides of the water-wall. Signage text was water-jet cut into the Alucobond. Alucobond was selected for its durability, according to Gates, who became familiar with the original aluminum composite material in a previous project for a car dealership. 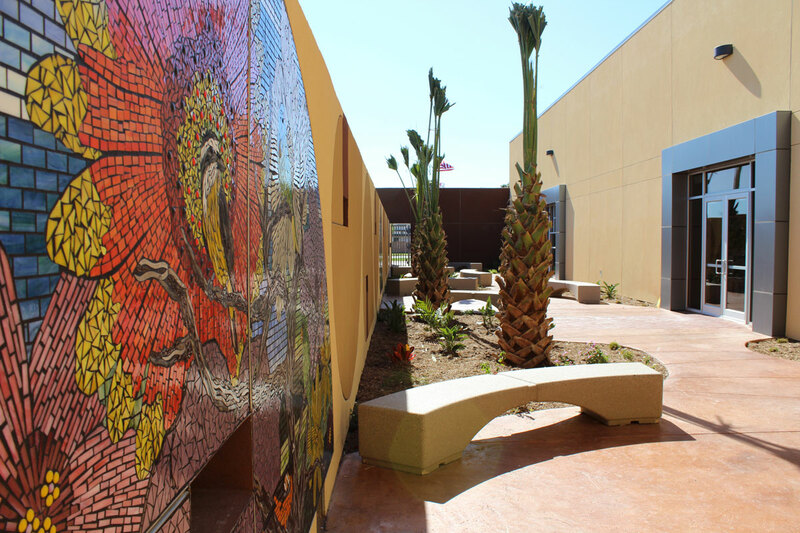 The Alucobond panels were fabricated by Bowman Distributing Co., of San Benito, Texas, which installed them with a rout and return wet-seal system. Barcom Construction, Inc., of Corpus Christi, Texas, served as general contractor for the project. 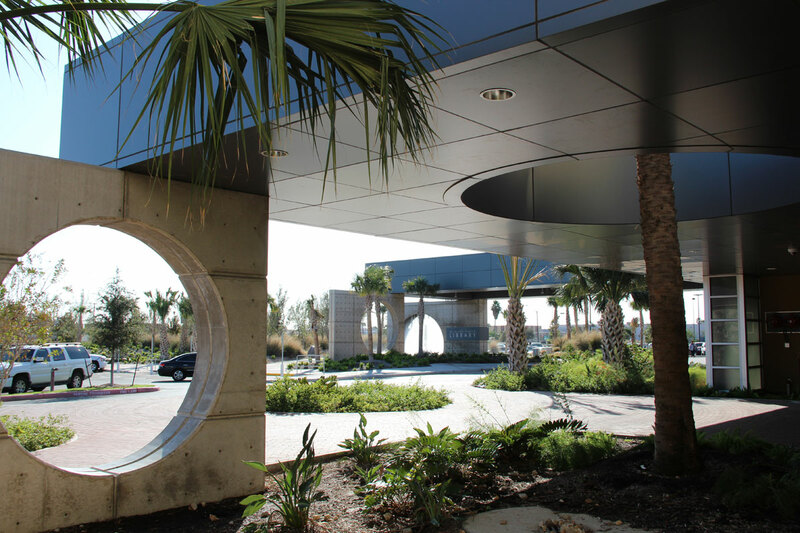 Formable Alucobond also performed well in the secondary 60-foot by 30-foot canopy, which includes a circular opening to allow a palm tree to grow through it, according to Eduardo Richa, general partner, Bowman Distributing Co. “The Alucobond shapes well,” said Richa. The secondary canopy is located on the library’s northeast corner, which is dark much of the time, according to Gates. 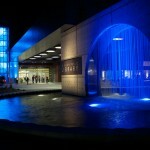 “We wanted to illuminate the space,” said Gates. “Putting the tree through the opening adds interest.” Gates said the Alucobond Steel City Mica color worked well in the building’s new color scheme, which Boultinghouse Simpson Gates created in consultation with Meyer, Scherer & Rockcastle, Ltd., of Minneapolis. The latter firm designed the library’s interior as a consultant to Boultinghouse Simpson Gates. Exterior walls of the old Walmart consisted of 12-inch thick concrete block painted light blue. Those walls were covered in stucco in the Baguette, Humble Gold and Rugged Brown colors. 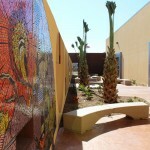 An outdoor children’s area is partitioned with a wall that features three tile mosaics by local artist Yolanda Cantu. Three storefront building openings trimmed in Alucobond face the mosaics. 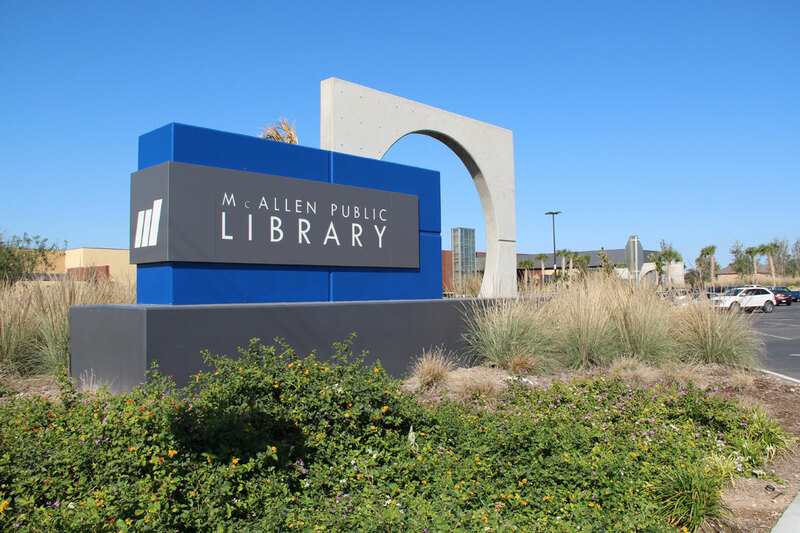 The Alucobond in the Steel City Mica color also is juxtaposed against the Hyper Blue epoxy paint denoting the City of McAllen in the library’s exterior concrete monument signage. 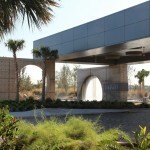 “The Alucobond is a fairly dark metal panel; but, it changes colors depending on the time of day,” said Gates. 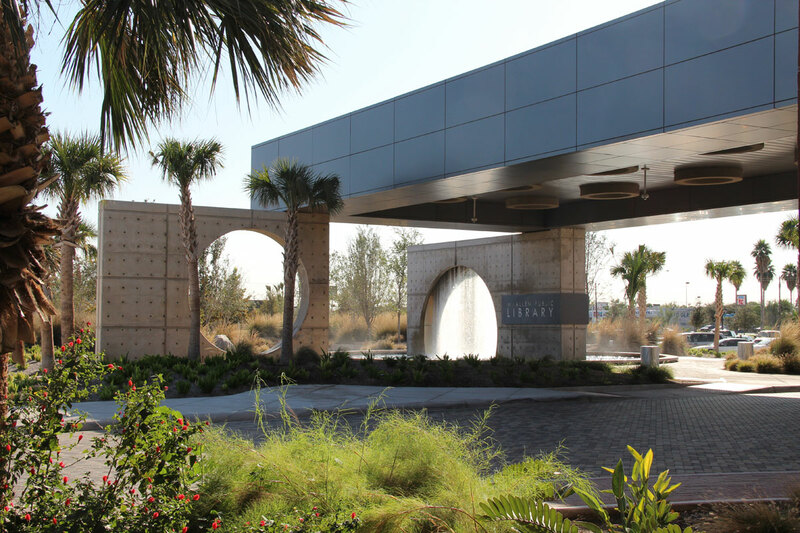 The new library has been well-received by the McAllen community, according to Horan, who said the walk-in gate count on Saturday and Sunday is averaging 4,000 visitors – the same number of visitors that the library’s former location would have seen in a month. 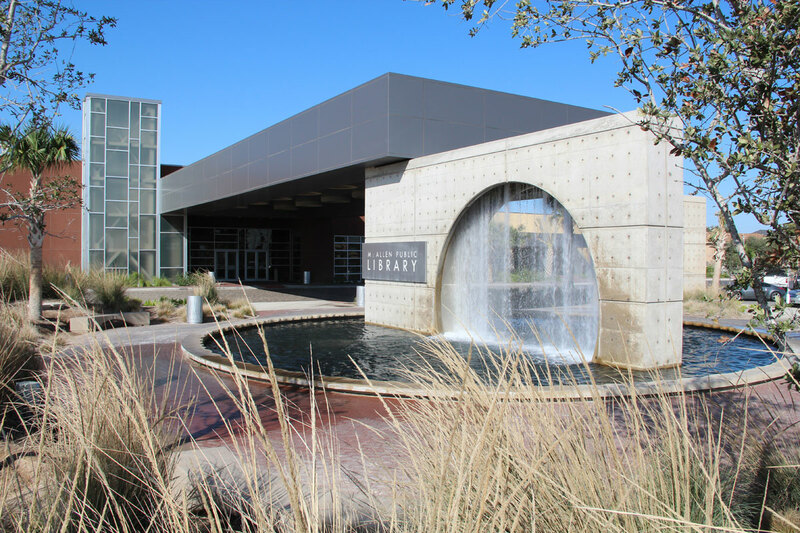 The new library serves as headquarters of the McAllen Public Library system, which includes two satellite branches. 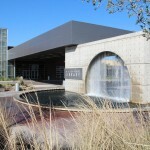 The service population for the McAllen Public Library is 133,978, according to the 2010 U.S. census. A total of 50,793 of those community members are registered borrowers. 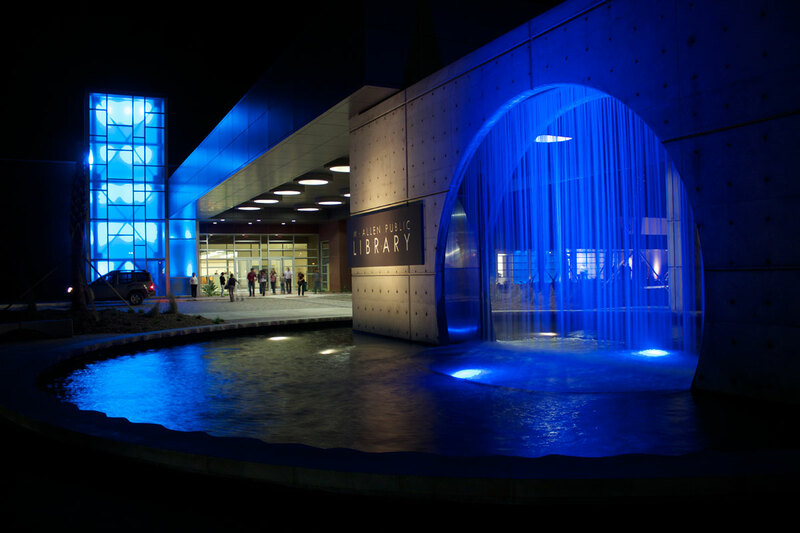 The McAllen Public Library has garnered awards in two national design contests, including: the 2013 American Institute of Architects Honor Awards for Interior Architecture and the International Interior Design Association/American Library Association’s 2012 Library Interior Design Competition.Moreover, the adapted building has met its charge from the McAllen City Commission. “If you’re new to the area, you’d never know that it was a Walmart,” according to Gates, who said visitors can contrast the adapted building with a new Walmart store built on property located just across the canal that runs right behind the library.